Light ’em up, up, up! That’s what I was singing while we hung the dining room light fixture. I saw “WE”, but I really mean Joel. He hung the light and it was a pain but it looks great! It took me months to find a light for this room. I was over thinking it (as usual) but I’m glad I held out. We ordered this fixture from World Market. (Sorry, looks like it’s not available online anymore?) It’s similar to this Ballard Designs light, but way more in line with our budget. It was on sale for $79 plus shipping. Sold! Let’s talk about this before picture. Ewwww, right? I hated this thing. It was old, ugly and gross. I mean, dirty gross. So happy it’s gone! Nothing is ever just a simple change around here *sigh*. For some reason the hardware that came with the light just wasn’t matching up to the holes and screws. I dunno. He wound up shoving some pennies, acting as washers, in there to make it work. I looked away and pretended I didn’t see that happen. That’s how we roll 😉 It hasn’t fell yet, so, win? 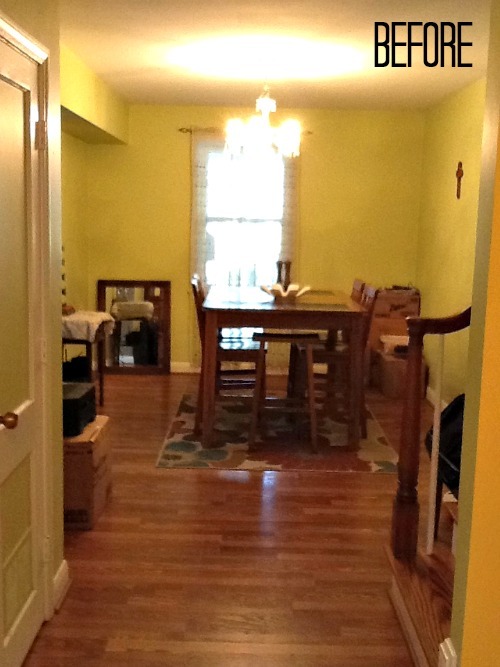 So, here’s a quick WAY before, maybe a week or two after moved in to this house and the progress we’ve made. Much better but still a ways to go. Did you work on any small but big impact changes this weekend? I’m working on a couple fun things this week that I can’t wait to share! 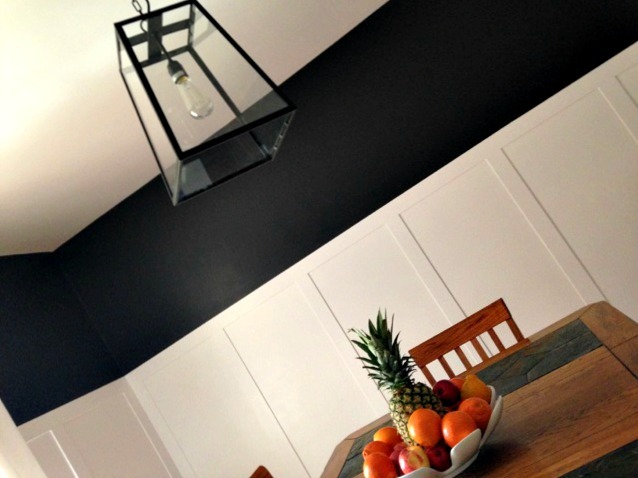 I LOVE that light fixture and your dining room looks great, I can’t wait to see what else you do in there! Thanks for sharing at The Makers! Love the before and after! What a huge difference! Love that light, the chandelier was great too but I love the update! It looks awesome! And I *love* what you did with your walls!!! Looks great so far! 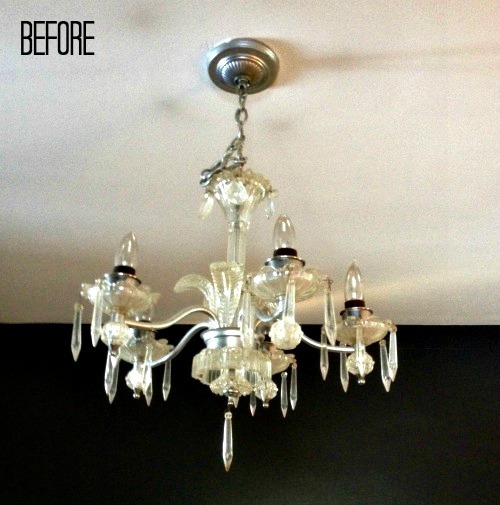 Thats a nice new fixture, though I’m having fantasies of fabulous up-cycling possibilities with the old chandelier style one. Great progress! Loving the new light fixture. Thanks for linking up to The DIY’ers! 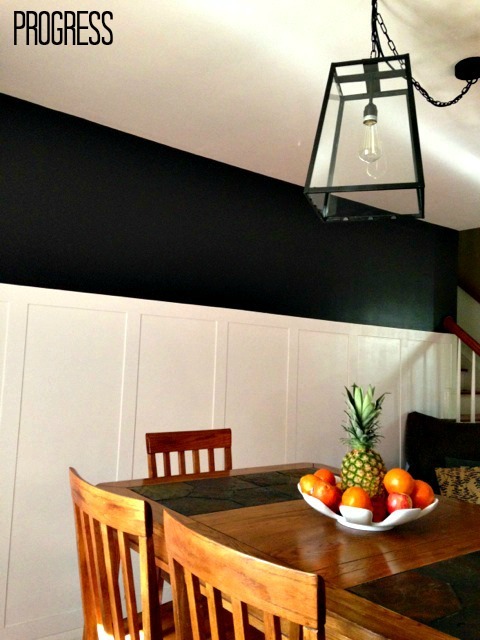 LOVE the light fixture and love the board and batten walls. Great job! Your light is the smaller version of the one I want from Ballard Designs! Imagine that! Your new light looks FABulous! Can’t wait to see the finished room! Thank you so much for sharing your creativity with us at Show-Licious Craft & Recipe Party! Join us again this Saturday morning! Love it! So cute! Thanks for sharing with us at Your Designs This Time!